When the Z is bad, he can be really good - he plays a Northern American power forward style of game. He has been known to check guys into the stands (just ask Carl Kingberg), he has been know to run over people going to the net, he has been to force even good D’s to cough up the pick with his incessant forechecking and he can play with passion and aggression. He also has good North-South speed, the shot of a scorer, the passing of a playmaker and is strong on his skates and on the puck. He doesn’t mind the limelight and is a leader on every team he plays for and can play the defensive side of the equation. The Z generally plays center on his club team and right wing in international tournaments. 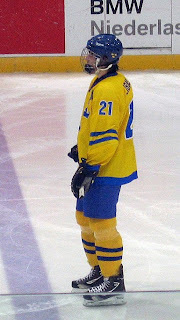 He was tied for his team’s (Team Sweden) lead in points at the U18’s with eight in six games. Normally, you would say that was a good thing. However, on closer inspection, all but two of his points came during a 10-2 blowout of Team Norway so he wasn’t really very productive scoring-wise. The point of the U18 story is to highlight the question which is central to where Z Bad should be drafted. Does the Z have the prerequesite skills to put up significant points as a top six power forward or is he more likely to be a very good bottom six forward who scores some goals. On the plus side are the skills mentioned above plus the demeanor of a star. On the negative size, he hasn’t always shown the finish of a scorer and hasn’t shown the agility and elusiveness of some of his top ten forward peers. As for me, I believe he will be a successful second line power center that most clubs are looking for these days - he just has too many positives and his demeanor just tips the scales to point to success. NHL Director of European Scouting Goran Stubb had a good description of Mika when he told NHL.com, "Mika's a real power forward but also has soft hands, good vision and fine skating skills. He has tremendous balance and is hard to knock off the puck. He's very strong in the battles along the boards, finishes checks with authority and has a heavy shot that he gets off quickly." For my money, Z Bad has the aura and the skills of a star in the making, someone who will make a difference in today’s NHL. NHL teams are prepared to pay “big-time” for what Z Bad brings to the table - top ten is likely; top five is possible. Bob MacKenzie’s June poll of scouts and I have him at nine.